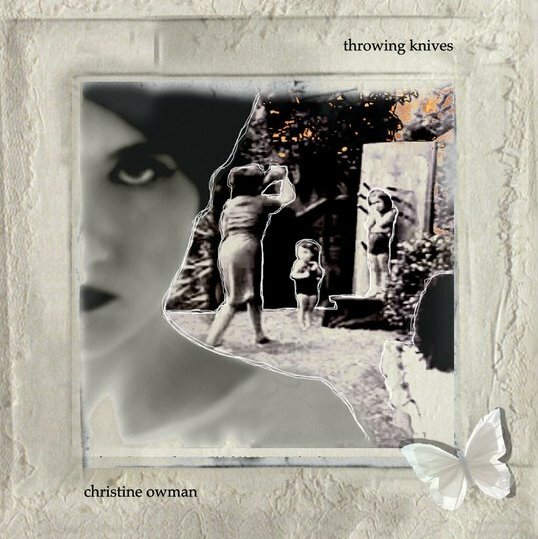 Throwing Knives – Christine Owman. Guest Blog By Shay Rowan. “Throwing Knives” by Christine Owman. “The thought counts, but the action makes the difference”. Sometimes the most enjoyable musical discoveries are unplanned and unexpected and so it was that finding myself with time to kill between scheduled gigs at last years Sound City Festival in Liverpool I stopped off at the friendly and atmospheric bar/venue Mello Mello seriously in need of a cool beer on a scorching day. 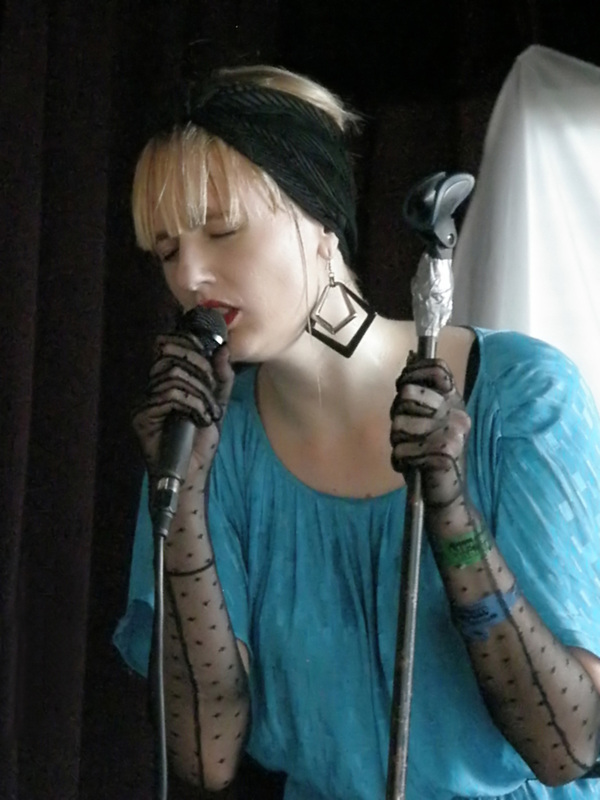 Along with just a handful of fellow punters I settled down to quench my thirst and watched as a girl, looking immaculate in a blue dress – her blond hair adorned with a black scarf – approached the side of the makeshift stage and proceeded to transform it’s appearance with a projector, a screen and an array of props. From a large suitcase she extracted a collection of instruments and finally a pair of full length black gloves which she slid over her arms whilst focusing intensely all the while on the performance ahead of her. This young lady – still unknown to me as yet – took her place amongst her lovingly crafted setting and as the screen flickered into life with images of circus performers, knife throwers and human cannonballs amongst others, she began to spin a web of fascinating sounds and captivating vocals that grew and developed during the performance as she built towards it’s powerful climax. Although the time was ticking away for the next gig that I had earmarked there was no way that I was leaving until this enthralling set was complete! The intensity and effort she displayed was worthy of a larger stage and far greater audience numbers and as she re-packed her belongings to clear the way for the next performer I took the opportunity to tell her how much I had enjoyed her set and only then was I able to add the name of Christine Owman to the exciting artist that I had just watched. As I left for my next gig clutching the “The Conflict” ep that she kindly gave me I promised myself that not only would I be certain to watch any future live shows but that I would also make further purchases at the next available opportunity. That opportunity has come now with the wider release of her album “Throwing Knives” (previously only available in her home country of Sweden). akin to that of a night spent at a rather sinister fairground where we find ourselves strapped to an emotional roller coaster! She plays with our feelings – one moment allowing us to bask in the sunshine of the merry-go-round the next thrusting us headlong into the darkness of an eerie ghost train ride. Opener “Spelling Words” (on which she is joined on vocals by Andi Almquist) sets the tone for the album by employing Christine’s virtuosity as a cellist to create a playful but sinister rhythm that wraps itself around you and draws you in with the dark seedy feel of a 1920’s Berlin night club. Following tracks “The Conflict” and the deceptively titled “Fast Fwd” are slower, hypnotic numbers. Seductive and sleazy in equal measure. A total change of style and pace sees “Circles” adopt an almost country feel with the vocal accompanied by a ukulele spiked with a feeling of menace. “Dance” is a return to a darker place – rumbling, distorted and growling with a relentless pace, whereas an altogether more gentle flow is created by the sound of delicately plucked strings as “The Agreement” recounts an enchanting promise made by two lovers that even should one of them die they will always continue to sing to each other in their dreams. “I Live I Die” has creepy jazz tinged overtones reminiscent of Fever Ray and “Sinners” is a track stripped back to minimal accompaniment in support of Christine’s vocal. More than any other track “Apart” is the one that allows the beauty of Christine’s voice to be displayed as she reveals her sensitivity in it’s gentle sway but, just as we begin to settle into a false sense of comfort, we are once again gripped by the lost and lonely vocal on closing track “Goodnight” a ghostly lullaby that indicates to us that maybe we shouldn’t go to bed without leaving the light on after all! A collection of songs that take us out of the shadows, into the light and back again revealing more on each listen. ‘Throwing Knives’ is an album that would certainly compliment anyone’s record collection, created by a performer who – when she graces our shores again – should certainly not be missed. here.- Nicole Atkins, Julia Haltigan, Kendra Morris – even a bit of Shipla Ray.